Peter Robert Jackson, CNZM (born 31 October 1961) is a New Zealand film director, producer, actor, and screenwriter, best known for The Lord of the Rings trilogy adapted from the novel by J. R. R. Tolkien. He is also known for his 2005 remake of King Kong and as the producer of the critically acclaimed film District 9. He won international attention early in his career with his "splatstick" horror comedies, before coming to mainstream prominence with Heavenly Creatures, for which he shared an Academy Award Best Screenplay nomination with his partner, Fran Walsh. Jackson has been awarded a total of three Academy Awards in his career. Jackson, an only child, was born on 31 October 1961 in Pukerua Bay , a coastal town near Wellington , New Zealand. His parents — Joan, a factory worker and housewife, and William Jackson, an accountant — were both immigrants from England. As a child, Jackson was a keen film fan, growing up on Ray Harryhausen films as well as finding inspiration in the television series Thunderbirds and Monty Python's Flying Circus. After a family friend gave the Jacksons a Super 8 cine-camera with Peter in mind, he began making short films with his friends. Jackson has long cited King Kong as his favourite film and around the age of nine he attempted to remake it using his own stop-motion models. Jackson has no formal training in film-making, but learned about editing, special effects and make-up largely through his own trial and error. As a teenager Jackson discovered the work of author J. R. R. Tolkien after watching The Lord of the Rings (1978), an animated film by Ralph Bakshi that was a part-adaptation of Tolkien's fantasy trilogy. After leaving school Jackson began working as a photoengraver at a newspaper company in Wellington, and shooting a feature-length vampire film that was later abandoned before completion. Over four years (from 1983 to 1987) Jackson's first feature, Bad Taste, grew in haphazard fashion from a short film into a 90-minute splatter comedy, with many of Jackson's friends acting and working on it for free. Shooting was normally done in the weekends since Jackson was now working full-time. Bad Taste is about aliens that come to earth with the desire of turning humans into food. Jackson created extensive special effects for the film, including an infamous scene of an alien drinking "vomit": muesli mixed with green food colouring. Jackson also takes two acting roles, including a scene in which he fights himself. The film was finally completed thanks to a late injection of finance from the New Zealand Film Commission, after Jim Booth, the body's executive director, became convinced of Jackson's talent (Booth would later leave the Commission, to become Jackson's producer). In May 1987 Bad Taste was unveiled at the Cannes Film Festival , where rights to the film quickly sold to twelve countries. Around this time Peter Jackson began working on writing a number of film scripts, in varied collaborative groupings with playwright Stephen Sinclair, writer Fran Walsh and writer/actor Danny Mulheron. Walsh would later become his partner. Some of the scripts from this period, including a Nightmare on Elm Street sequel, have never seen the light of a movie screen; the proposed zombie film Braindead underwent extensive rewrites. Jackson's next film to see release would turn out be Meet the Feebles (1989), co-written by the four writers mentioned above. An ensemble musical comedy starring Muppet-style puppets, Feebles originally began as a short film intended for television, but was rapidly expanded into a full-length script after unexpected enthusiasm from Japanese investors, and the collapse of Braindead, six weeks before filming. Begun on a very low budget, Feebles went weeks over schedule. Feebles went on to win the worst reviews of Jackson's career to date, but has now established a cult following. "It's got a quality of humour that alienates a lot of people," Jackson said at the time. "It's very black, very satirical, very savage." Feebles marked Jackson's first collaboration with special effects team Richard Taylor and Tania Rodger, who would subsequently work on all Jackson's movies. Jackson's next release was the horror comedy Braindead (1992) (released in North America as Dead Alive), now seen as a landmark in splatter movies. Originally planned as a Spanish co-production, the film reversed the usual zombie plot — rather than keeping the zombies out of his place of refuge, the hero attempts to keep them inside, while maintaining a facade of normality. The film features extensive special effects including miniature trams, stop motion and a plethora of gory make-up effects, but also won praise for its strong performances, particularly that of lead actor Tim Balme. Balme plays the closeted young man who discovers that his domineering mother is decaying into a zombie. Released in 1994 after Jackson won a race to bring the story to the screen, Heavenly Creatures marked a major change for Jackson in terms of both style and tone. The film is based on real-life events: namely the Parker-Hulme murder in which two teenage girls in 1950s Christchurch became close friends, some say lovers, and later murdered the mother of one of the girls. Jackson's partner Fran Walsh helped persuade him that the events had the makings of a movie; Jackson has been quoted saying that the film "only got made" because of her enthusiasm for the subject matter. Many New Zealanders were apprehensive about how Jackson would treat the material, an apprehension that would later turn in many cases to relief. The film's fame coincided with the New Zealand media tracking down the real-life Juliet Hulme, who now wrote books under the name Anne Perry. Jackson would cast the actors Melanie Lynskey and Kate Winslet in the roles of Parker and Hulme. Heavenly Creatures received considerable critical acclaim, including an Academy Award nomination for Best Original Screenplay and making top ten of the year lists in Time, The Guardian, The Sydney Morning Herald, and The New Zealand Herald. The success of Heavenly Creatures won Jackson attention from US company Miramax, who promoted the film vigorously in America and signed the director to a first-look deal. The following year, in collaboration with Wellington filmmaker Costa Botes, Jackson co-directed the mockumentary Forgotten Silver (1995). This ambitious made-for-television piece told the story of New Zealand film pioneer Colin McKenzie, who had supposedly invented colour film and 'talkies', and attempted an epic film of Salome before being forgotten by the world. Though the programme played in a slot normally reserved for drama, no other warning was given that it was fictionalized. Many were outraged at discovering Colin McKenzie had never existed. Some have argued that the number of people who believed the increasingly improbable story provides testimony to Jackson and Botes' skill at playing on New Zealand's national myth of a nation of innovators and forgotten trail-blazers. In the meantime, Jackson and Walsh had two children, Billy (1995) and Katie (1996). A drawing of Peter Jackson, surrounded by characters from his films. The success of Heavenly Creatures helped pave the way for Jackson's first big budget Hollywood film, The Frighteners starring Michael J. Fox, in 1996. Thanks partly to support from American producer Robert Zemeckis, Jackson was given permission to make this comedy/horror film entirely in New Zealand despite being set in a North American town. This period was a key one of change for both Jackson and Weta Workshop, the special effects company — born from the one man contributions of George Port to Heavenly Creatures — with which Jackson is often associated. Weta, initiated by Jackson and key collaborators, grew rapidly during this period to incorporate both digital and physical effects, make-up and costumes, the first two areas normally commanded by Jackson collaborator Richard Taylor. The Frighteners was regarded as a commercial failure. Some critics expressed disappointment that it displayed little of the anarchistic humor of Jackson's early movies and that the script felt underdeveloped. In February 1997 Jackson launched legal proceedings against New Zealand magazine The Listener for defamation, over a review of The Frighteners which claimed that the film was "built from the rubble of other people's movies". In the end, the case was not pursued further. Around this time Jackson's remake of King Kong was shelved by Universal Studios, partly because Mighty Joe Young, another giant gorilla movie, had already gone into production. This period of transition seems not to have been entirely a happy one; it also marked one of the high points of tension between Jackson and the New Zealand Film Commission since Meet the Feebles had gone over-budget earlier in his career. Jackson has claimed the Commission considered firing him from Feebles, though the NZFC went on to help fund his next three films. In 1997 the director submitted a lengthy criticism of the Commission for a magazine supplement meant to celebrate the body's 20th anniversary, criticizing what he called inconsistent decision-making by inexperienced board members. The magazine felt that the material was too long and potentially defamatory to publish in that form; a shortened version of the material went on to appear in Metro magazine. In the Metro article Jackson criticized the Commission over funding decisions concerning a film he was hoping to executive produce, but refused to drop a client-confidentiality clause that allowed them to publicly reply to his criticisms. Peter Jackson won the rights to film J. R. R. Tolkien's epic in 1997 after meeting with producer Saul Zaentz. Originally working with Miramax towards a two-film production, Jackson was later pressured to render the story as a single film, and finally overcame a tight deadline by making a last minute deal with New Line, who were keen on a trilogy. Principal photography stretched from 11 October 1999 to 22 December 2000 with extensive location filming across New Zealand. With the benefit of extended post-production and extra periods of shooting before each film's release, the series met huge success and sent Jackson's popularity soaring. The Return of the King itself met with huge critical acclaim, winning a total eleven Academy Awards, including Best Picture and Best Director making Jackson one of only six people to win Oscars for producing, directing, and writing in the same year. The film was the first of the fantasy film genre to ever win the award for Best Picture and was the second sequel ever to win Best Picture (the first being The Godfather Part II). Jackson's mother, Joan, died three days before the release of the first movie in the trilogy, The Fellowship of the Ring. There was a special showing of the film after her funeral. Following The Return of the King, Jackson lost a large amount of weight (over 50 lb/22.5 kg) to the point of being unrecognisable to some fans. In the British Daily Telegraph he attributed his weight loss to his diet. He said, "I just got tired of being overweight and unfit, so I changed my diet from hamburgers to yogurt and muesli and it seems to work." Universal Studios now returned to the fray, signing Peter Jackson for a second time to remake the 1933 classic King Kong — the film that inspired him to become a film director as a boy. He was reportedly being paid a fee of US$20 million upfront, the highest salary ever paid to a film director in advance of production, against a 20 percent take of the box-office rentals (the portion of the price of the ticket that goes to the film distributor, in this case Universal). The film was released on 14 December 2005, and grossed around US$550 million worldwide. Its release on home video and DVD was even bigger, as it set records for a Universal Pictures DVD in sales figures. Jackson is currently directing a version of Alice Sebold's bestseller, The Lovely Bones, which is now in post-production and is scheduled to be released in December 2009. He has said the film will be a welcome relief from his larger-scale epics. The storyline's combination of fantasy aspects and themes of murder bears some similarities to Heavenly Creatures. Jackson also announced that he would produce and direct a Tintin movie along with Steven Spielberg. The project will use 3-D animation combined with motion capture to bring the project to the silver screen, likely in 2011. Jackson had talked of producing films for others as early as 1995, but a number of factors slowed developments in this regard, including the failure of Jack Brown Genius (1995). After Jackson became a force in Hollywood, he was set to produce a $128 million movie version of the sci-fi video game Halo, but the project went on hold when financial backers withdrew their support. Jackson will produce a remake of The Dam Busters in 2009, to be directed by longtime Weta designer Christian Rivers and for which Stephen Fry has written a screenplay. Jackson has also earned the rights to a film adaptation of the fantasy novel series Temeraire, a novel about dragons being used in combat in the Napoleonic Wars and the story of a dragon named Temeraire and his captain, Will Laurence, during that time period, written by Naomi Novik. It remains to be seen if he will direct it. Jackson produced District 9, a sci-fi project which Neill Blomkamp directed. The script was written by Neill Blomkamp and Terri Tatchell, and Sony Pictures distributed the film. In recent years Jackson has also directed a short film entitled Crossing the Line to test a new model of digital Cinema camera, the RED ONE. The film takes place during World War I, and was shot in two days. "Crossing the Line" was shown at NAB 2007 (the USA National Association of Broadcasters). Clips of the film can be found at Reduser.net. Jackson and his newly formed studio Wingnut Interactive are working on an unrevealed project being developed by Microsoft Game Studios in collaboration with Bungie Studios. The project has been officially titled Halo: Chronicles but beyond speculation little else is known about its nature. Jackson was to be the executive producer on a Halo movie, developed and released by Universal Studios and 20th Century Fox but in October 2006 the film was postponed indefinitely. The film was never officially cancelled and in late June 2008 Peter Jackson commented that, "With upcoming developments (Halo: Chronicles), I wouldn't know when to expect a movie, and I'm the producer." Jackson spent $5 million to purchase 20 hectares of land in Wairarapa, a property containing a mansion, private lake, underground tunnel and the interior of Bag End from The Lord of the Rings. In 2009, Jackson purchased a Gulfstream G550 jet. Jackson's total networth is estimated by National Business Review at $450 million. Jackson owns an aircraft restoration and manufacturing company, The Vintage Aviator, which is dedicated to World War One and World War Two fighter planes among other planes from the 1920s and 1930s. He is chairman of the Omaka Aviation Heritage Trust, which hosts a biennial air show. Jackson's involvement in the making of a film version of The Hobbit, along with another possible The Lord of the Rings prequel, has a long and chequered history. 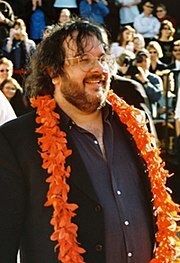 In November 2006, a letter from Peter Jackson and Fran Walsh stated that due to an ongoing legal dispute between Wingnut Films (Jackson's production company) and New Line Cinema, Jackson would likely not be directing the film. However, in response, MGM spokesman Jeff Pryor stated that "we still believe this matter of Peter Jackson directing The Hobbit is far from closed." (MGM owns the distribution rights to The Hobbit film). New Line Cinema's head, Robert Shaye said that Jackson "will never make any movie with New Line Cinema again while I'm still working for the company." An online boycott of New Line Cinema was begun in the hopes of compelling New Line Cinema to renegotiate with Peter Jackson. Shaye's comments marked the first time a New Line executive had commented publicly on the franchise since Jackson announced that he was pulled out of the project. In August 2007 though Shaye was trying to repair his working relationship with Jackson. "I really respect and admire Peter and would love for him to be creatively involved in some way in The Hobbit," Shaye said." On 18 December 2007, it was announced that Peter Jackson and New Line Cinema had reached agreement to make two prequels, both based on The Hobbit, which will be released in 2011 and 2012. Jackson will serve as a writer and executive producer. Guillermo del Toro has been selected to direct. Jackson is set to make games with Microsoft Game Studios, a partnership announced on 27 September 2006, at X06. Specifically, Jackson and Microsoft were teaming together to form a new studio called Wingnut Interactive. In collaboration with Bungie Studios, Jackson was to co-write, co-design and co-produce a new game taking place in the Halo universe - tentatively called Halo: Chronicles. However on July 27, 2009, in an interview about his new movie District 9, he said that Halo: Chronicles had been cancelled, while Microsoft confirmed that the game is "on hold". Jackson's game studio Wingnut Interactive is now at work on original intellectual property. It remains to be seen in which way the partnership will continue. Jackson has given NZ$500,000 to stem cell research. He purchased a church in Wellington for about $10 million, saving it from demolition. He also contributes his expertise to 48HOURS, a New Zealand film-making competition, through annually selecting 3 "Wildcards" for the National Final. Jackson is known for his attention to detail, a habit of shooting scenes from many angles, a macabre sense of humour, and a general playfulness—the latter to the point where The Lord of the Rings conceptual designer Alan Lee jokingly remarked "the film is almost incidental really". Jackson was a noted perfectionist on the Lord of the Rings shoot, where he demanded numerous takes of scenes, requesting additional takes by repeatedly saying, "one more for luck". Jackson is also renowned within the New Zealand film industry for his insistence on "coverage" — shooting a scene from as many angles as possible, giving him more options to choose from in the editing process. Jackson has been known to spend days shooting a single scene. This is evident in his work where even scenes featuring simple conversations often feature a wide array of multiple camera angles and shot-sizes as well as zooming closeups on characters' faces. One of his most common visual trademarks is shooting close-ups of actors with wide-angle lenses. Unlike some other film directors, Jackson has remained in his native country to make films. This has been the genesis of several production and support companies. Most of Jackson's assets are found on the Miramar Peninsula in his home town of Wellington where much of his filming occurs; and he was instrumental in having the world premiere of The Return of the King in the city's iconic Embassy Theatre which he helped restore. During filming of The Lord of the Rings, Jackson was famous for wearing short pants and going barefoot under most circumstances, especially during film shoots. Jackson won three Academy Awards for The Return of the King, including the Academy Award for Best Director. Jackson was appointed a Companion in the New Zealand Order of Merit, in the 2002 New Years Honours. Jackson appears as a bi-plane gunner attacking Kong in New York, reprising the cameo which original King Kong filmmaker Merian C. Cooper made in his 1933 film. The Lord of the Rings film trilogy includes multiple cameos. In The Fellowship of the Ring Jackson plays Albert Dreary, a drunken, carrot-chomping citizen of Bree. In The Two Towers he plays a spear-throwing defender of Helm's Deep. His significant cameo in The Return of the King is limited to the extended version, where he is seen as the boatswain of a corsair ship and is accidentally killed by Legolas's "warning shot." (Gimli had messed with Legolas's bow.) (The character is seen very briefly in the theatrical version.) Additionally, though not a cameo in the traditional sense, he also served as a stand-in for Sean Astin in the shot where Samwise Gamgee steps into frame, challenging the monster Shelob; all that can be seen of Jackson, however, is his right arm. In Heavenly Creatures, he is a bum that gets kissed by Juliet Hulme. In the puppet movie Meet the Feebles Jackson appears as an audience member disguised as one of the aliens from Bad Taste. He has also made cameos in several films not directed by him. In the opening sequence of Hot Fuzz (2007), he played a demented Father Christmas, who stabs Nicholas Angel (played by Simon Pegg) in the hand. Jackson's eldest son, Billy (born 1995), has made cameo appearances in every one of his father's films since his birth, namely The Frighteners (1996), The Lord of the Rings film trilogy, and King Kong. His daughter, Katie (born 1996), appears in all the above films except The Frighteners. Jackson had a cameo on the HBO show Entourage in the 5 August 2007 episode, "Gary's Desk", in which he offers a business proposal to Eric Murphy, manager to the lead character, Vincent Chase. The Lord of the Rings: The Two Towers (2002): Musician, "Edoras"
Brian Sibley. Peter Jackson- A Film-maker's Journey. Sydney, HarperCollins, 2006. ISBN 0732285623. Andrea Bordoni, Matteo Marino, "Peter Jackson". Milan, Il Castoro, 2002. ISBN 9788880332251. The first book-length study of the director.